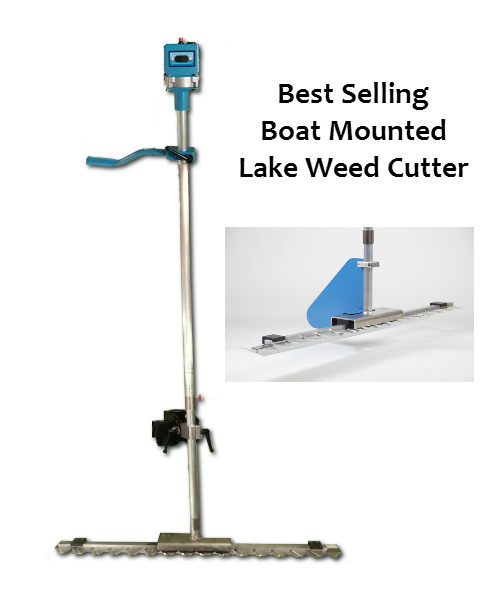 This electric battery powered heavy duty lake weed cutter has been designed to be one of the most effective and user friendly boat mounted underwater weed cutters ever built. It's designed to quickly mow and cut just about any type of aquatic vegetation. It mounts on the back or side of nearly any smaller type of boat. It is also manufactured with high quality components in the USA. We have an area in our pond with lots of water lilies and were looking for a eco-friendly way to get rid of them. The mower worked well for cutting the lilies but it takes to people in the boat. One to run the trolling motor and one in front with the mower to keep weeds from wrapping around the arm after they're cut. I am using the cutter for about two acres of "water shield". So far it has performed reliably and set up was fairly easy. A couple comments: it is awkward and heavy. Attached to front of Jon boat and pushed forward. In thick weeds would have one person keeping weeds from building up on cutter arm (drag issue), and if you are paddling - have at least two doing it in thick weeds.